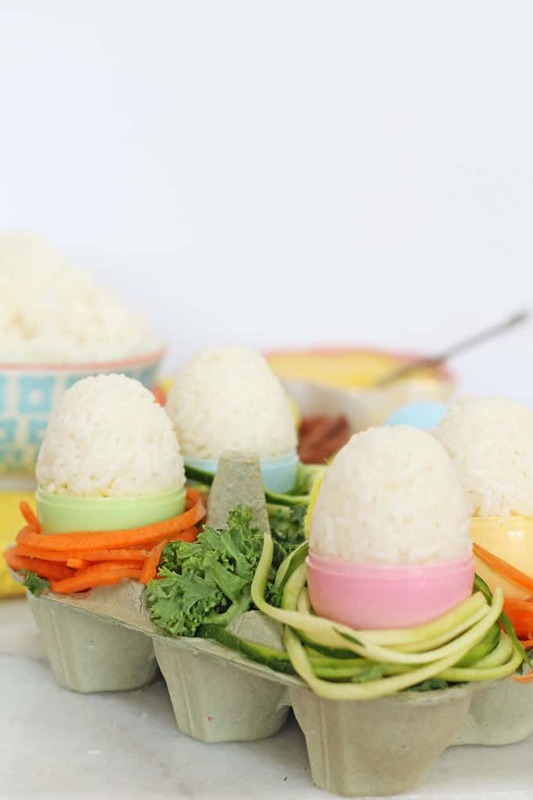 A healthy twist on Easter eggs, made with sticky rice and spiralized vegetables. 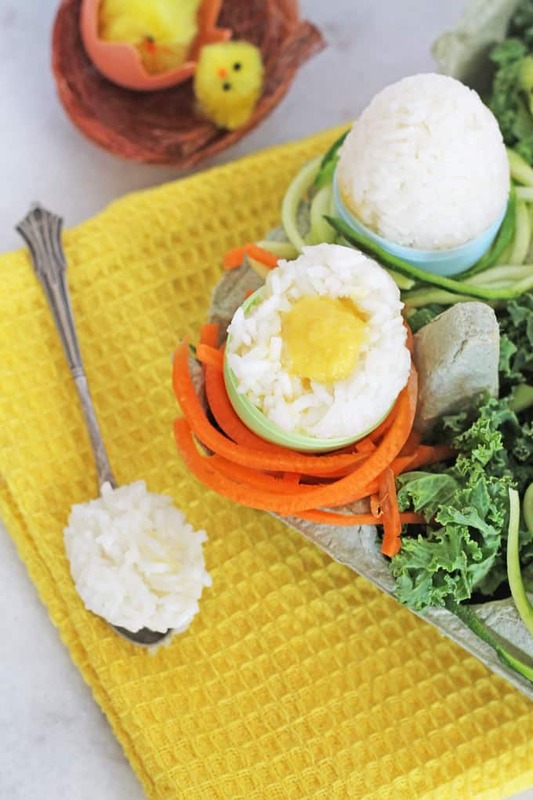 Crack open the rice egg to reveal the hidden vegetable “yolk”! With Easter just a few days away now chocolate is literally everywhere… Creme Eggs, Mini Eggs and chocolate Easter eggs galore! I’m trying to hold back the onslaught of all that sugar for another few days (trust me, my kids are hyper enough, they don’t need any help from sugar!) so I thought I would make a healthier version of Easter eggs with rice and veggies. 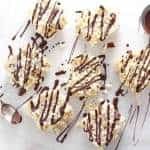 Ok so these aren’t quite as tasty as a big fat chocolate egg but they are lots of fun to make and a great way to occupy the kids for a couple of hours during the Easter holidays. There’s no special equipment needed. I used hollow plastic eggs to mold the rice. These are available everywhere at the moment; supermarkets, 99p stores, etc. You will also need a couple of empty egg boxes. The eggs themselves are made with sticky (or glutinous) rice. 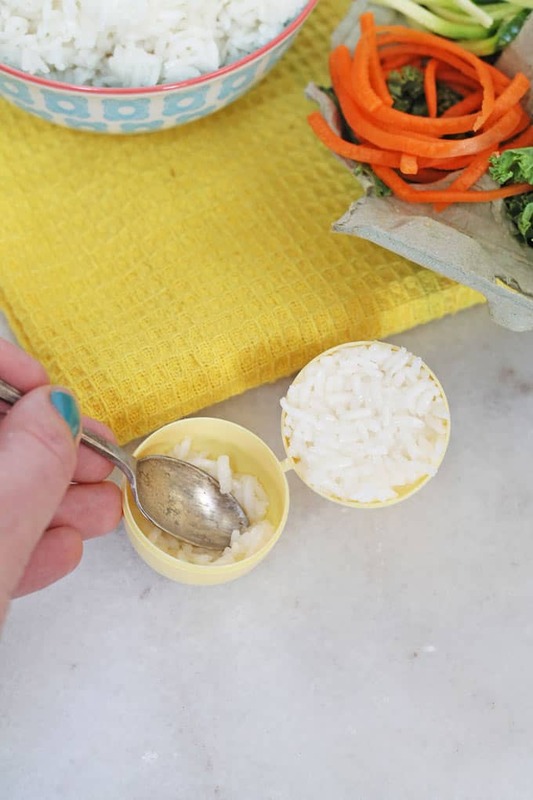 This type of rice sticks together a lot easier so it will hold the egg shape well. If you can’t find this, then ordinary rice will work too. 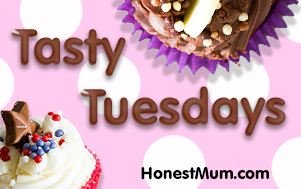 If you boil it quickly with lots of water it should get quite mushy on the outside, helping it all to stick together. 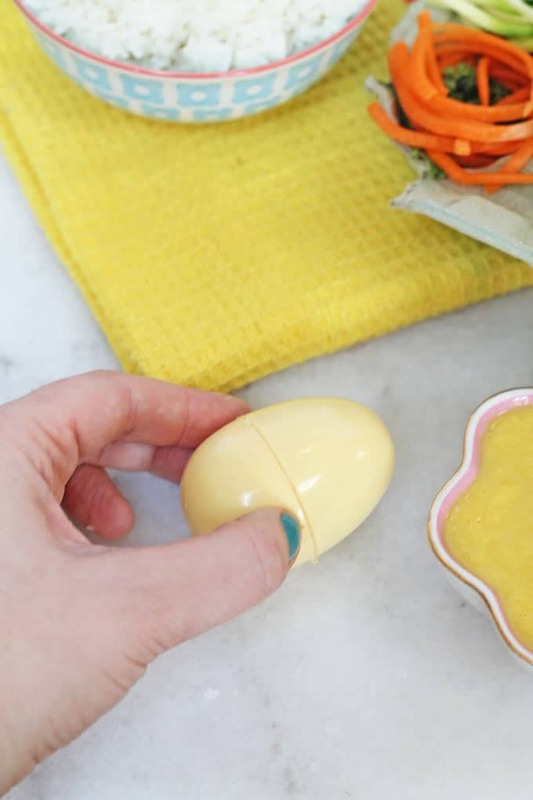 The bright yellow of the “yolk” is made from pureed tinned sweetcorn. Simply blitz it in a blender with a little water until completely smooth. 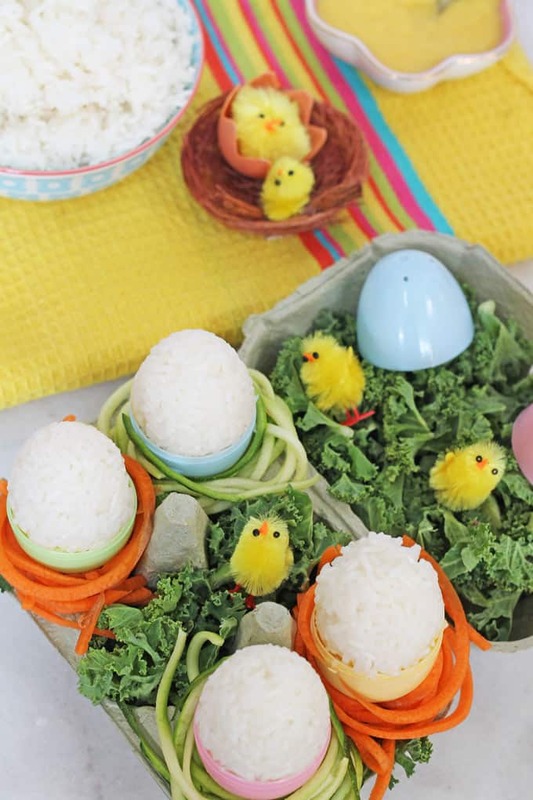 So easy and the kids will get such a kick out of breaking into the rice egg to get to the centre! You can use whatever veggies you like for the egg nests. I used some kale to give the effect of grass and then spiralizer courgette and carrot for the egg nests. If you don’t have a spiralizer you could use a julienne peeler or standard veg peeler to get a similar effect. My fussy eater really got a kick out of these healthy Easter eggs and I even caught her nibbling on the veggie nests. Anything that makes vegetables a little less scary and a little more fun for kids is definitely worth trying! Cook the rice and place it to one side in a bowl to cool slightly. But don’t let it get cold as warm rice will mold together easier than cold rice. Make the sweetcorn puree by blitzing it in a blender. You may have to add a little water to get it to blend smoothly. Spoon the cooked rice into the egg molds and press down hard with a spoon to ensure the rice goes all the way to the bottom. 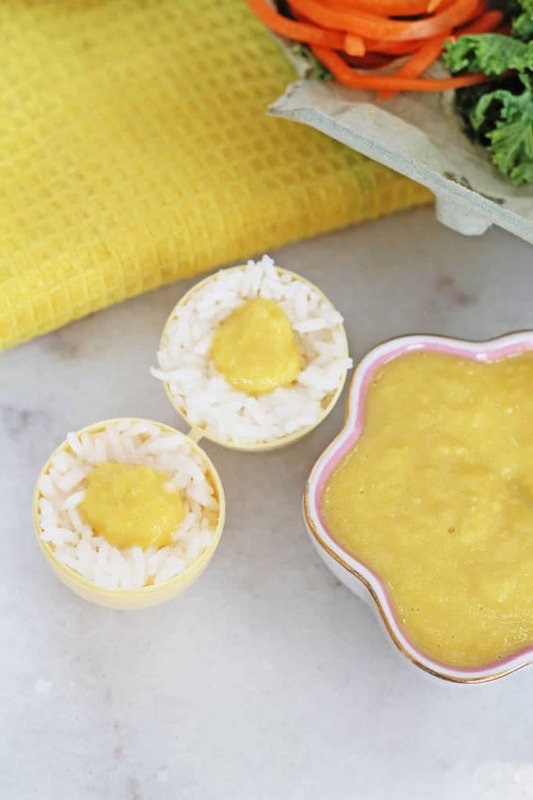 Make a small well in the middle of each of the egg halfs and add about a teaspoon of the sweetcorn puree to each. Close the egg molds and press together. Put the mold to one side to cool and repeat with the remaining eggs. 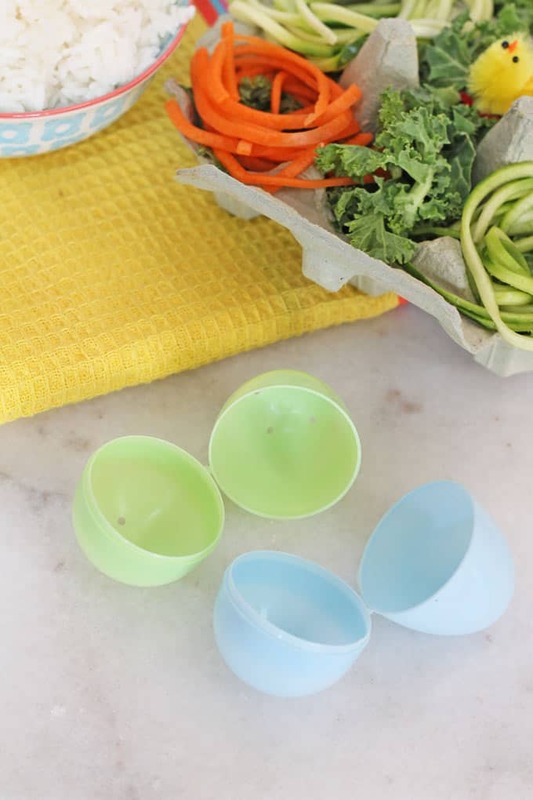 Prepare the egg boxes by filling them with raw kale. Spiralize the carrot and the courgette and make nests by twirling the strands round and placing them on top of the kale. When the rice has cooled, carefully open the egg mold and remove the top half of the mold, leaving the bottom half of the mold in place. If the rice gets stuck run a sharp knife along the inside of the mold and it should pop out easily. 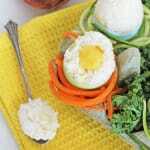 Place the rice egg on top of the spiralized vegetables. These are too cute! Can’t wait to make these again this coming Easter. I absolutely love these, they are just so clever and utterly gorgeous! Going straight on my to-try list for the holidays! Thanks Grace. Hopefully it’ll keep the kids entertained for a little while at least! These look fantastic! Super idea. I wonder if you could make ‘brown’ eggs by using very well cooked brown rice that way you could introduce some useful fibre in as well – not sure how sticky it would be, but I think if you cooked it long enough you might manage. Thinking of giving it a go……. Yes Ruth I think if you cook it for long and at a high temperature, so that the outside of the rice gets mushy before the inside gets cooked. That way it will be more likely to stick together. Let me know how it goes. Yeah they wouldn’t quite cut it as a replacement but they’re fun to make just as a snack or part of dinner! I absolutely love these. What a genius idea. Your styling and photographs are beautiful too. 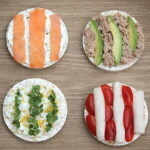 I’m going to give them a try with sushi rice and perhaps keep the a sushi theme with fishy yolks. They also add further weight to my reasoning that I NEED to get a spiraliser! That sounds like an amazing idea with the sushi. I love it! 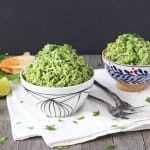 Yes you absolutely must get a spiralizer. They are brilliant! Thanks Chantelle. Sticky rice is the best! Your toddler has good taste!! Such a clever idea! I love these and they are also super cute. What a fab idea Ciara. Guess who is off to buy some mini egg cases.